After your sod is installed you should keep it thoroughly moist for at least 10 days. Although Calgary does not have a very hot climate in the summer, the warm air combined with high winds can dry sod out in Calgary very fast. We recommend watering your sod for one hour in the morning and an hour in the evening. Do not water your new sod during the day when the sun is at its most intense, you could risk burning the new sod. Watering your sod in the early morning or late evening is best and also conserves water consumption. After watering take the time to check the sod for any dry spots that may have been missed and hand water those areas thoroughly. After ten days to 2 weeks, you can begin to water the sod every once every 2 days or so depending on the weather. If it is very hot you may have to stick with twice daily. After a few weeks when you can see new grass growth in the sod you can begin to water every 5 days thoroughly for 1.5 hours. Watering weekly after this should be sufficient to maintain a healthy lawn. Note: During the first couple weeks you may see brown lines down the seams of the sod. Don’t be concerned as these are the areas where the sod was cut, and it will take a few weeks until the fresh grass grows in its place. Fertilizing sod. Do not fertilize your sod for at least a month. Chinook Landscaping has fertilized the sod with root-start fertilizer which helps the sods roots get established quickly. After a month or so you can fertilize your new lawn. Please do not walk on your new sod for a minimum of 10 days, especially areas that are very wet. The sod needs to be left undisturbed while the roots get established. If you must walk on the sod then take a different root each time so as not to be too hard on one specific area of your lawn. Fertilizing is an important lawn care practice, as it influences grass color, ability to recover from stress, and helps prevent weed invasions and disease. There are important features to consider when choosing lawn fertilizers. Nitrogen (N), phosphorus (P), and potassium (K) are the three major nutrients needed by lawns. Nitrogen is the nutrient required most, although too much nitrogen can cause excessive top growth, leading to assorted problems. Percent nitrogen (by weight) is always the first of three numbers on the fertilizer bag, followed by phosphorus and potassium. For example, an 18-6-12 fertilizer contains 18 percent nitrogen. This number is important because it determines how much fertilizer is needed. In most cases, a rate of 1 pound of nitrogen per 1,000 square feet is suggested for each fertilizer application to the lawn. If high percentage nitrogen fertilizers are used, then less actual fertilizer product is needed to supply that one pound compared to fertilizers with low percent nitrogen. Recommended ratios of N-P-K for lawn fertilizers include 3:1:2 or 4:1:2. Another important factor in choosing nitrogen fertilizers is what kind of nitrogen is actually in the product. Nitrogen fertilizer may consist of fast-release or controlled-release nitrogen. Advantages and disadvantages are outlined in the table below. For lawns, fertilizers containing controlled-release nitrogen sources are suggested for most applications. Check the guaranteed analysis information on the fertilizer label for information on what forms of nitrogen are in the product. 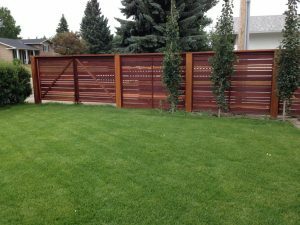 Call us today for your free estimate at 403- 452-8552.